Delaware is famous for our tax free shopping, world-class entertainment options, and you'll also find romantic hideaways, scenic byways and fun places for the whole family. You may just want to slip back into America's proud past: Walk the cobblestone streets of New Castle… visit the square in Dover where Delawareans rallied around the U.S. Constitution… enjoy festivals. From north to south, the landscapes also promise seasons of exceptional bird watching, fishing, hunting and camping, along with trails for biking, hiking and canoeing. Delaware's network of public and private airports can readily accommodate commercial and corporate aircraft. Worldwide passenger service is 1/2 hour from downtown Wilmington at the Philadelphia International Airport. Delaware's small size roughly 100 miles from its northernmost to southernmost points. Six historic Wilmington homes moved inthe mid-1970s to create an urban park. Part of the Delaware History Center complex operated by the Historical Society of Delaware. Rockford Tower, Wilmington, A 100-year-old stone tower offering a panoramic view of the Brandywine Valley. There are no areas in Delaware lacking county government. The levy court is the administrative body in Kent County. In New Castle and Sussex counties, the county council is the governing body. The state's motto, "Liberty and Independence" is inscribed on the coat of arms, which is incorporated into both the state seal and the state flag. 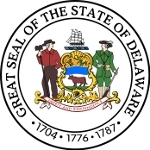 The state's official nickname, "The First State" commemorates the fact that on December 7, 1787, Delaware became the first of the 13 original states to ratify the United States Constitution. Delaware's climate is moderate year round. Average monthly temperatures range from 75.8 to 32.0 degrees. Average temperature in the summer months is 74.3 degrees. About 57% of the days are sunny. Annual precipitation is approximately 45 inches. Temperatures along the Atlantic Coast are about 10 degrees warmer in winter and 10 degrees cooler in summer. The average growing season varies from 170 to 200 days. 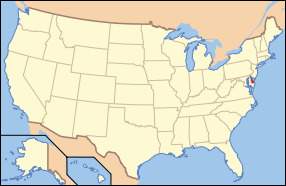 Delaware, located on the eastern seaboard of the United States, is bordered by the Atlantic Ocean and the Delaware Bay, as well as by the states of New Jersey, Pennsylvania, and Maryland. With a land area of 1,982 square miles, Delaware ranks 49th in area among the 50 states. The Dover Air Force Base, located next to the state capital of Dover, is one of the largest Air Force bases in the country and is a major employer in Delaware. More than 50% of all U.S. publicly traded companies and 63% of the Fortune 500 are incorporated in Delaware. The state's attractiveness as a corporate haven is largely because of its business-friendly corporation law.